When I click Download This Video, the box that shows the download progress is minimized and stuck at the bottom of the screen. Why can't I open or move it so I can use it? 1. Open Windows Task Manager (right-click anywhere in the bottom bar of your screen, and select "Start Task Manager"). 2. Click the Applications tab. 4. Resize the window by scrolling the mouse to the bottom left or bottom right corner of the window; when the double-headed arrow appears, click and drag it to adjust the size. 5. Close the window. Next time you use Download This Video, the window should open to the size you selected. Note: If this does not work right away, try restarting the computer. If that doesn't help, try reducing the screen resolution for your computer (in the Display settings). 1. 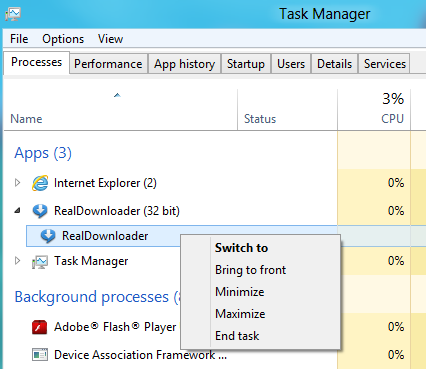 Right-click on the task bar and select Task Manager, or press Ctrl-Alt-Delete from anywhere and you'll see a link to launch the Task Manager. 2. Under the Processes tab, "RealDownloader (32bit)" will be listed. 3. Click the little arrow to expand "RealDownloader." 4. After expanding, you will notice "RealDownloader" appear again underneath. 5. Right-click the second "RealDownloader" and select Maximize. This will open RealDownloader in full screen mode. 6. Resize the Realdownloader window by moving the mouse to either the bottom left or bottom right and dragging the corner to adjust the size. 7. Close the window. Next time you use Download This Video, the window should open to the size you selected.